Wallpaper can be viewed more or less like Botox injections. 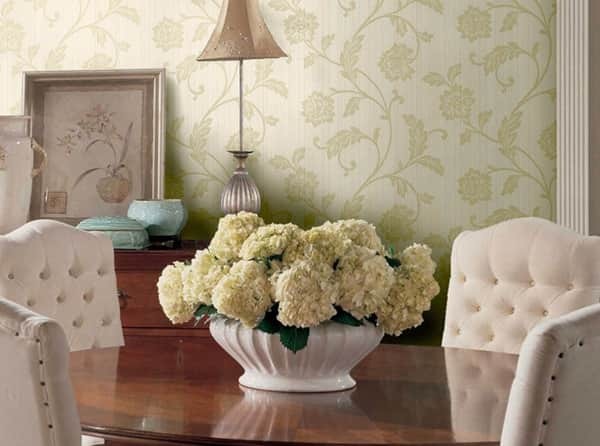 Just like Botox injections, wallpapers help breath life and vibrancy into a “tired” room. 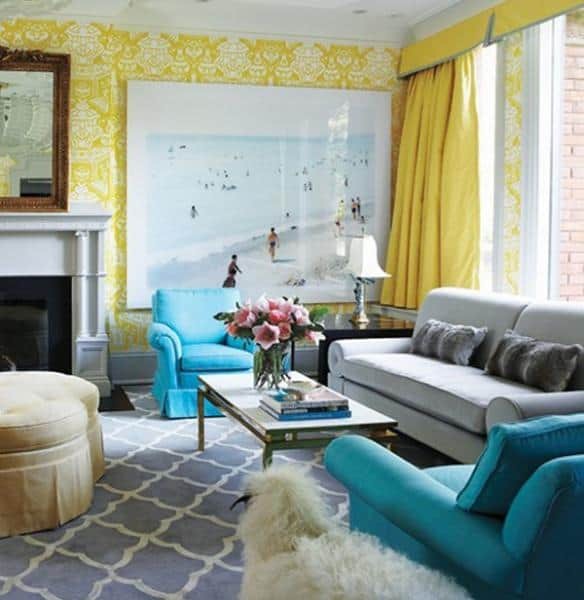 Paint helps perk the view up, but wallpaper is the better choice since it adds more than just color. 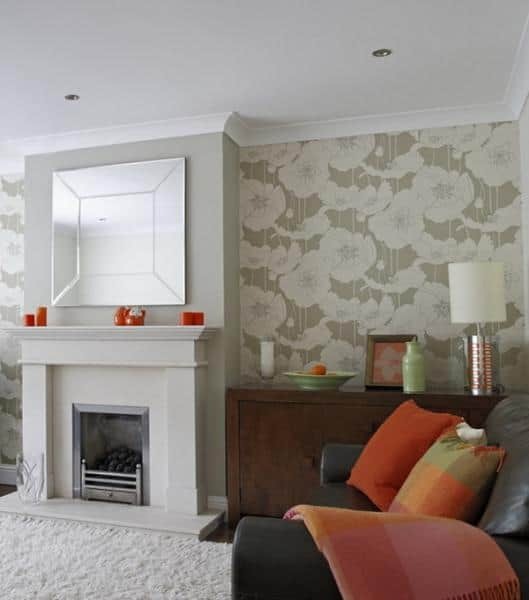 Wallpaper gives the walls character, dimension and pattern, a feat that is otherwise difficult to achieve with paint. 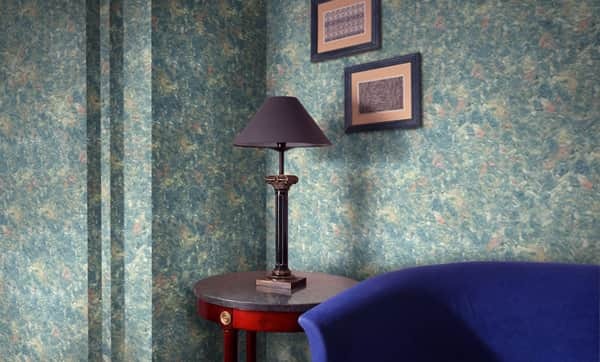 If you want to paint the wallpaper, choose a “duplex” with embossing, coarse-fiber wallpaper (with pressed wood chips). 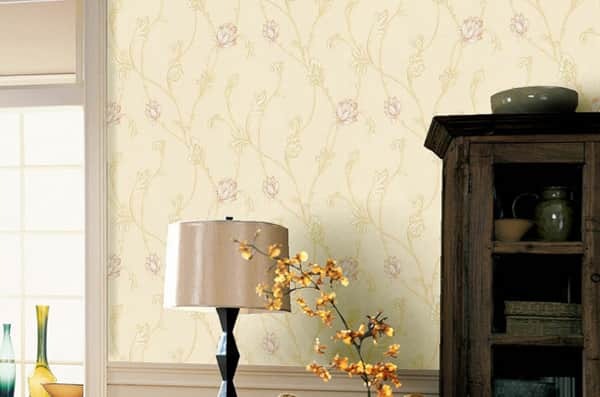 The advantages of paper wallpapers are their low cost and ease of maintenance. The disadvantages lie in the relative fragility, as well as the fact that paper wallpaper lacks the ability to hide the defects on the wall. 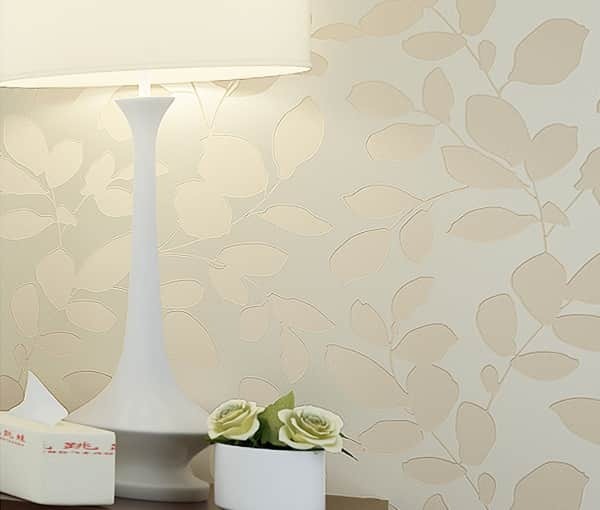 Paper wallpaper can be applied in any room, but given its low humidity, its use can at times be limited. 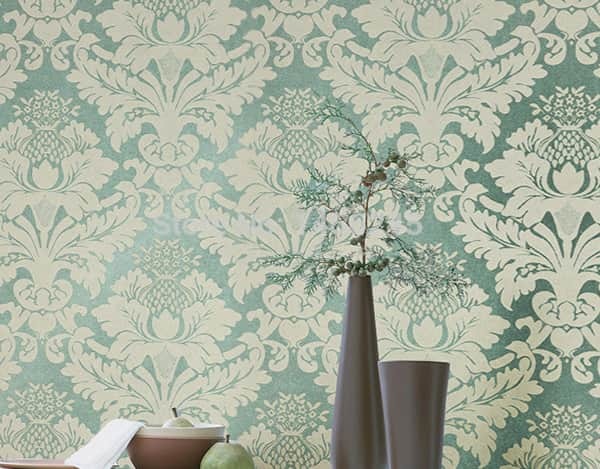 Wallpaper, which is a classic traditional decoration for the interior has experienced a strong resurgence in the last decade. 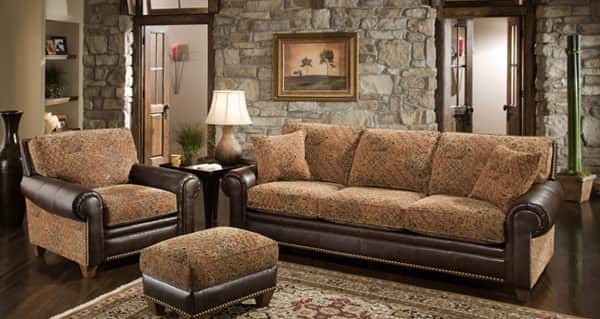 Manufacturers these days delight consumers with vast ranges, more playful patterns and diverse textures and colors. 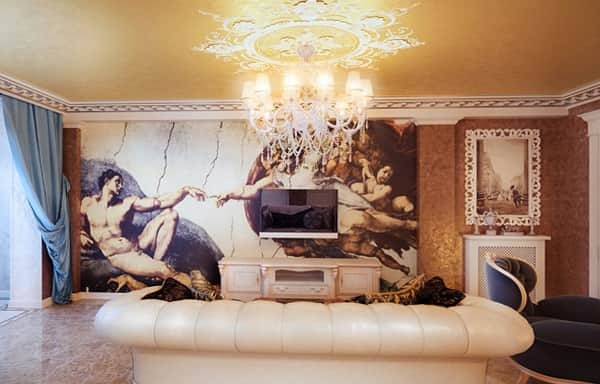 Thanks to the latest advances in printing technology, applying wallpaper has not just gotten easier, it is also more fun. 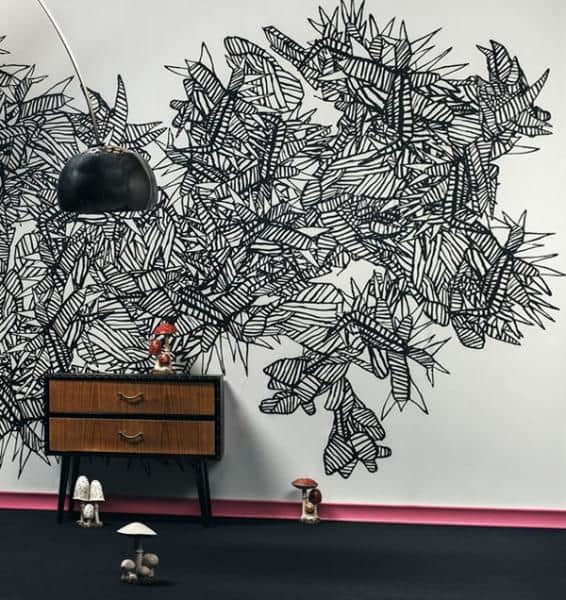 Design companies are constantly experimenting with new materials and surprising their customers with interesting wallpaper projects that imitate lace, feathers, mosaic, wood and even animal skins. Tactile creations are just as attractive as sparkling colors. 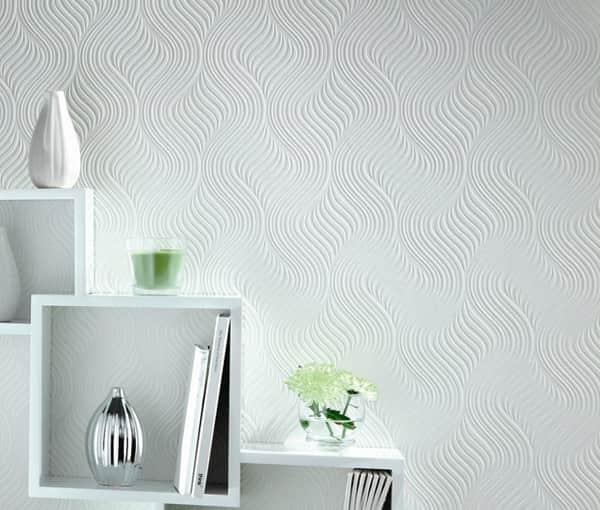 Textured wallpaper with embossed details remains true to the classic décor. 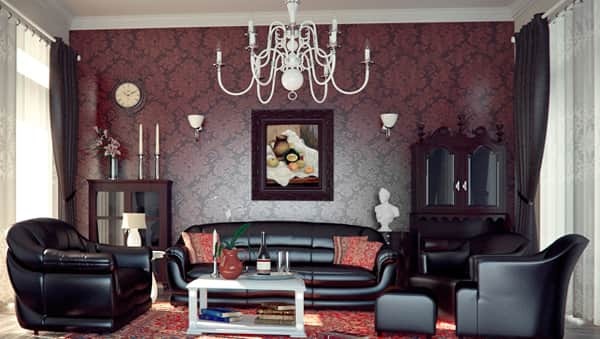 Wallpapers in dark colors visually reduce the size of the room. 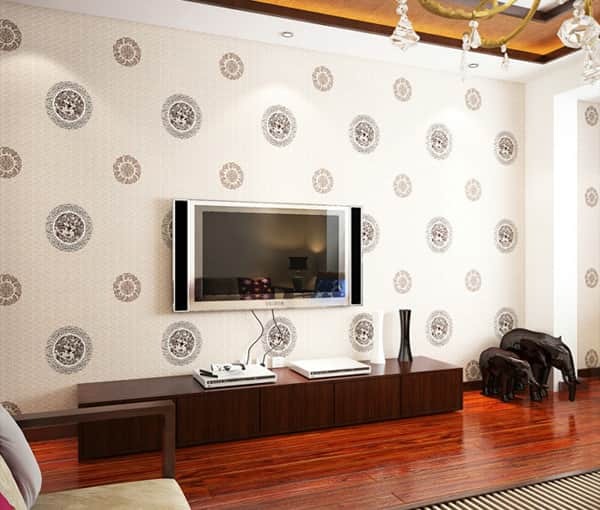 Vinyl wallpaper is a practical and convenient solution for those who want to decorate their house simply and effectively. 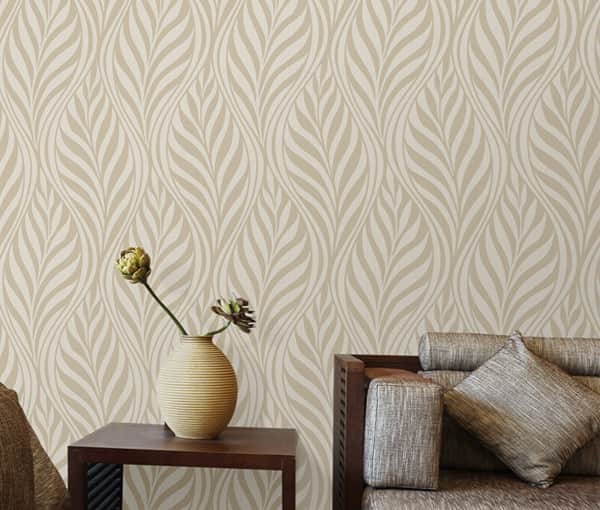 One might be curious about the exact difference between vinyl wallpaper and paper wallpaper. Well, the difference is that vinyl wallpaper has vinyl (or polyvinyl chloride) coating, whereas paper wallpaper does not. Vinyl is a reliable, durable material that is capable of serving for many years. Vinyl possesses certain special properties, including a shiny surface. The composition of the coating (on paper or non-woven base) can contain chemical additives such as dispersants, resins and so on. 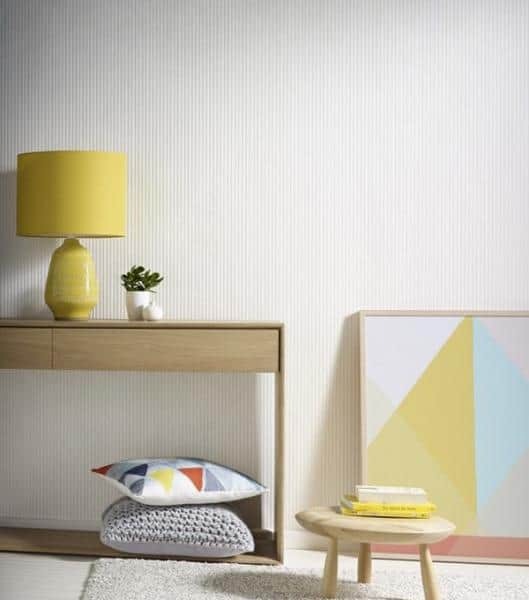 It is these chemical additives that give vinyl wallpaper durability, since the additives impart strength, water resistance and protection against ultraviolet radiation. 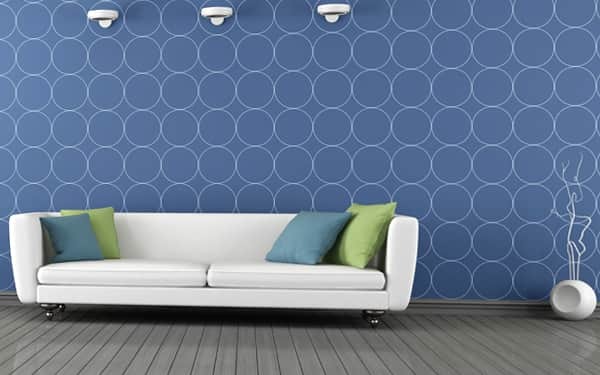 Because of their resistance to water, vinyl wallpapers are easy to clean- they can be easily washed, even when they have stubborn stains and dirt. 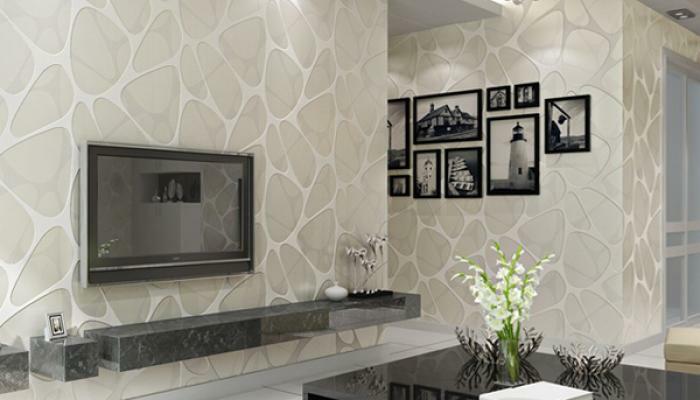 In addition, their resistance to steam and water are makes these wallpapers suitable for use in the kitchen and bathroom. CAUTION: One important factor to note about vinyl wallpaper is that they should not be cleaned using cleaning agents with strong chemicals. This is because strong chemicals can be aggressive and ruin the vinyl cover. 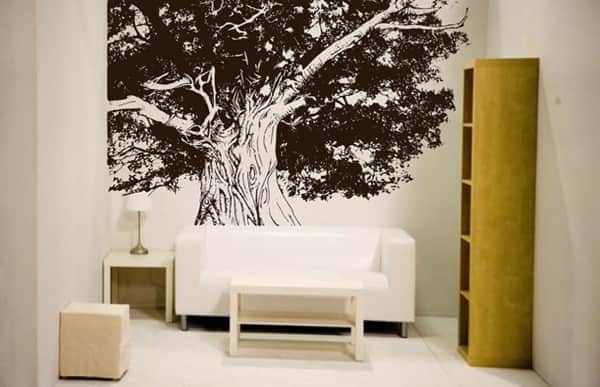 The types of vinyl wallpaper on the basis of vinyl structure are: foamed, heavy, compact and silkscreen vinyl. 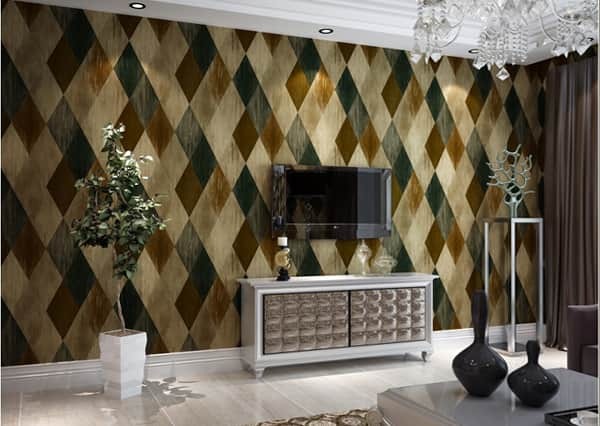 From an aesthetic point of view, these wallpapers can be presented in different colors, with a variety of patterns and motifs, characteristic of a particular space in the apartment. 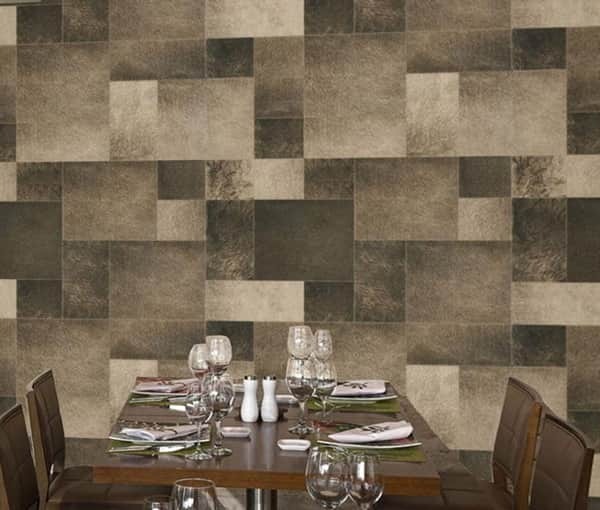 The wallpapers can also imitate an array of interesting textures including wood, stone, leather and marble. 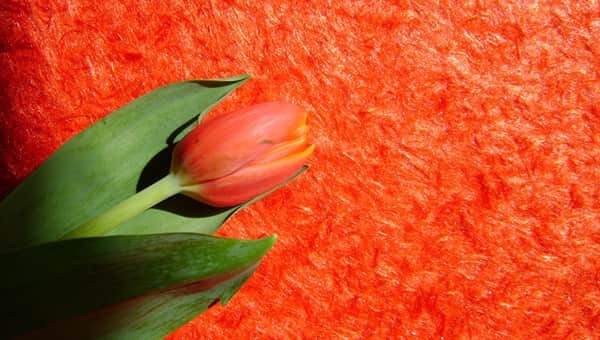 It is composed of non-woven textile and cellulose fibers. 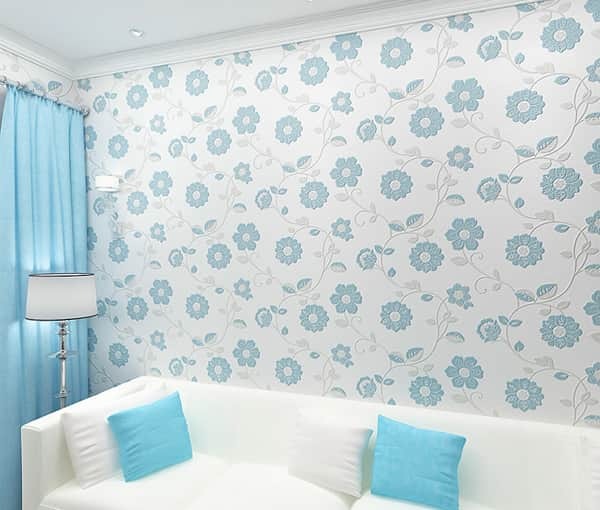 Non-woven wallpapers have strong sound and thermal insulation. 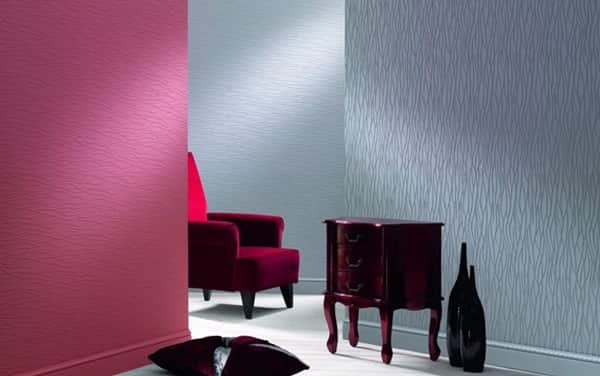 At the same time, these wallpapers absorb dust, odors and moisture and are therefore not recommended for use in hallways and corridors. 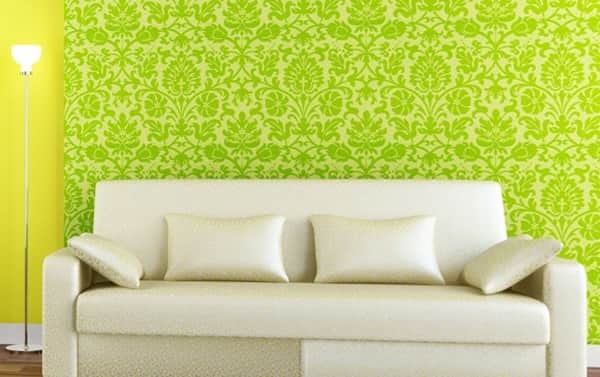 To attach the wallpapers to the wall, use special glue which is only applied to the wall and not to the actual wallpaper. 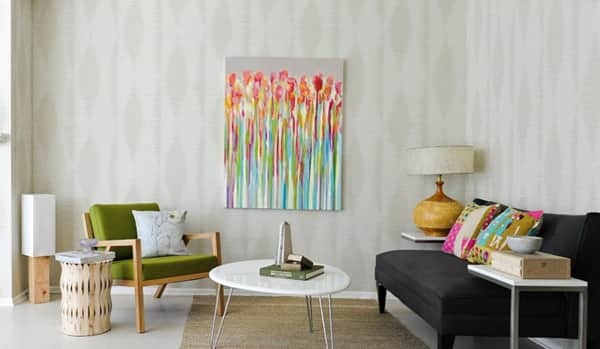 Flizeline wallpaper can be painted with latex or acrylic paints. 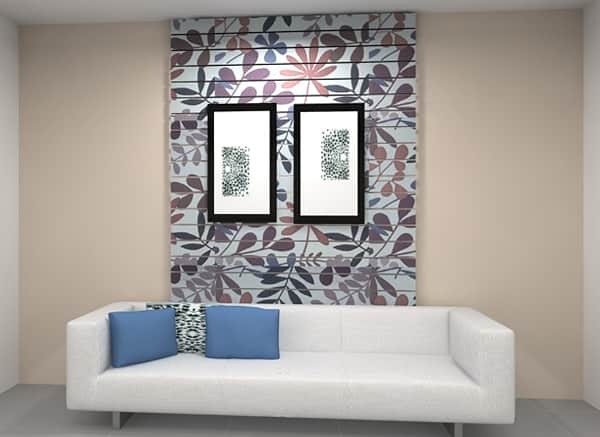 This type of wallpaper is based on paper (or non-woven fabric), with a woven coating (cotton, silk, wool, canvas, jute, polyester). 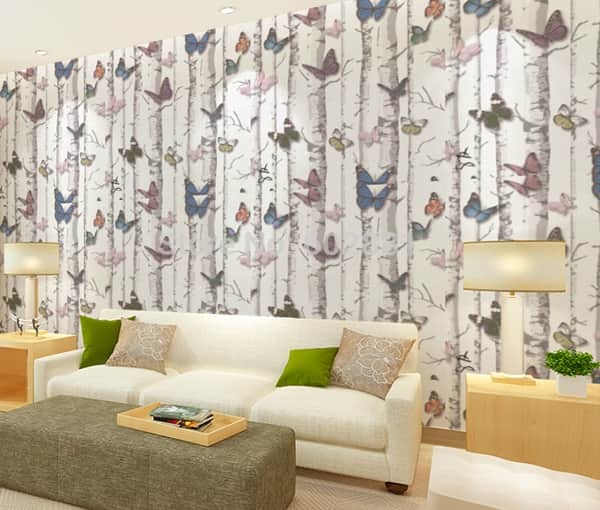 Textile wallpaper is suitable for those who aim to achieve a warm and natural look. 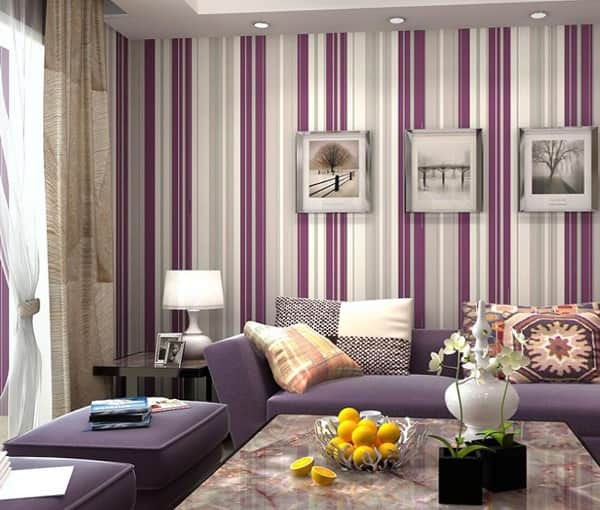 Textile wallpapers provide strong sound absorption and are better than conventional wallpapers. 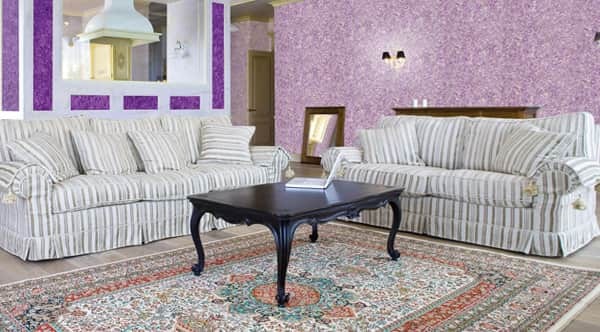 Textile wallpapers are cleaned by vacuuming or by a wet sponge treatment. 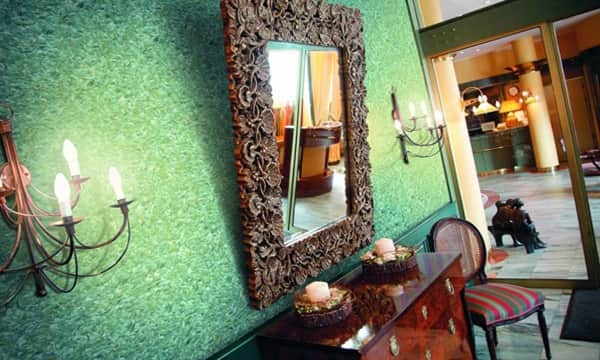 Glass-weaving wallpaper, which is woven from fiberglass (which includes quartz sand, limestone, dolomite and soda). 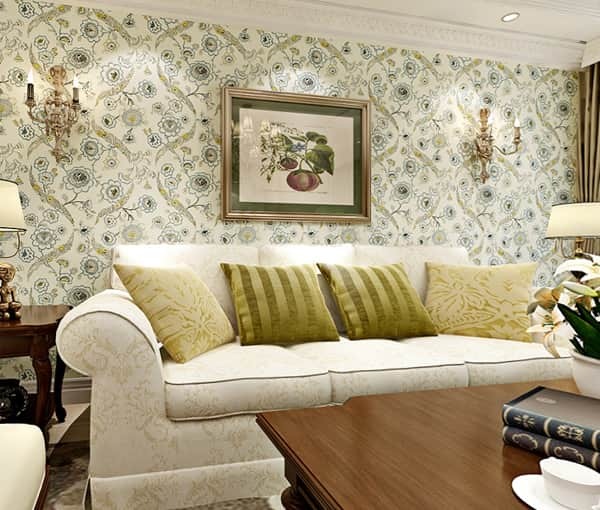 The most popular choices of wallpaper are those that can be painted on. Their popularity has been driven by their practicality, include dust and chemical resistance, fire resistance and health safety. Anaglypt: This wallpaper is textured. It is created from paper and vinyl. 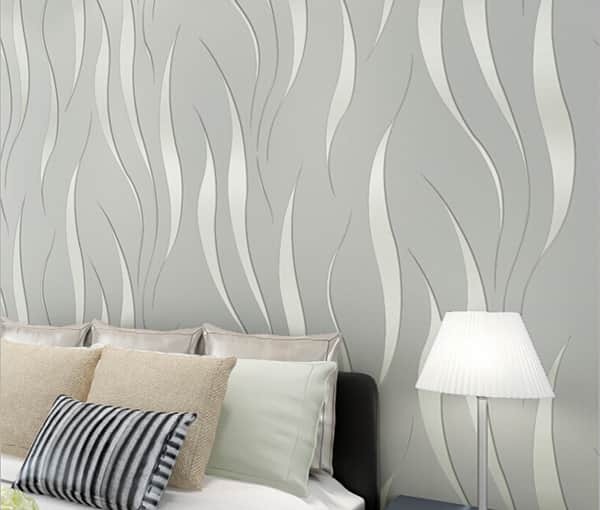 Liquid wallpaper is a loose composition containing cellulose, various textile fibers (silk, cotton) and glue substance. It is diluted with water, depending on the manufacturer’s instructions, before applying it to the walls using a roller (or spray). Liquid wallpapers perfectly hide the small defects on the surface of the wall. 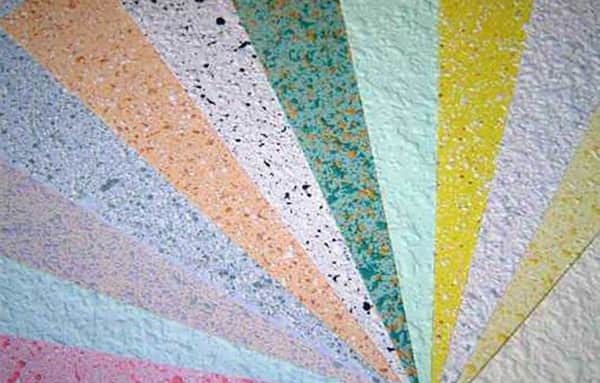 When mixed with special paints, the resulting outcome is in different colors and textures. 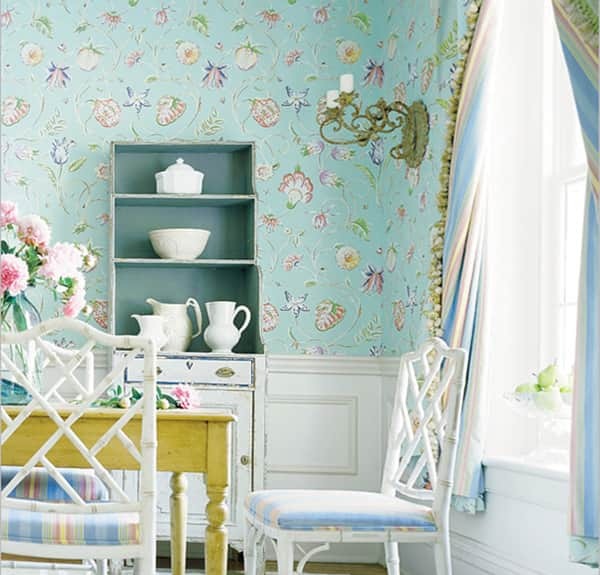 These wallpapers are particularly suited for use in the hall. 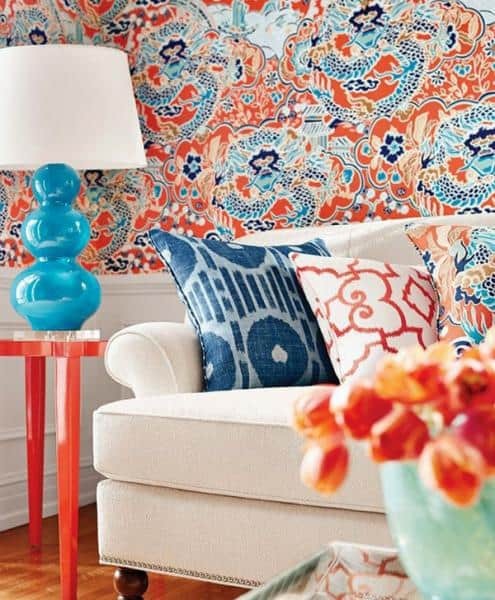 After decades of “expulsion” of wallpaper in the style of New York designs, the wallpaper is once again at the center of design trends in New York designs. 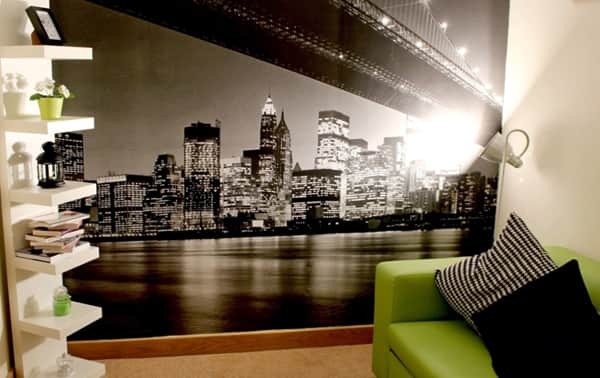 New York designs feature photo wallpapers that inscribed with iconic New York images like the Brooklyn Bridge, the Statue of Liberty and Broadway. Photographs that feature New York’s reputation as “a city that never sleeps” make a beautiful backdrop for the hall walls. Using wallpapers with photos that depict the lights and colors of New York’s Times Square, give the interior energy and vitality. Bright yellow taxis against the backdrop of Broadway theaters or the majestic Central Station are one of the many icons of New York and are beautiful when used on wallpapers. Images of New York’s most famous skyscrapers and symbols of the metropolis – Empire State Building, Chrysler Building make an awesome addition when used on wallpapers. Some homeowners prefer alternative images like the mystical Bronx plants, amusement parks and the Coney Island promenade. If you are not sure about the choice of themes for wallpapers, you can as well draw your inspiration from the eternal beauty of nature. 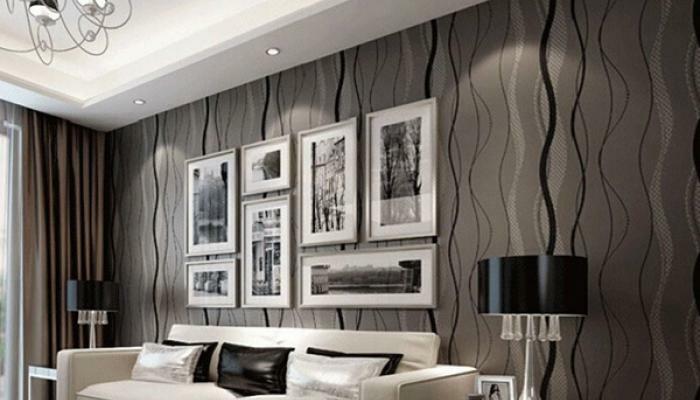 Photo wallpapers with beautiful landscapes never lose style, remaining a traditional form of decoration for the hall. 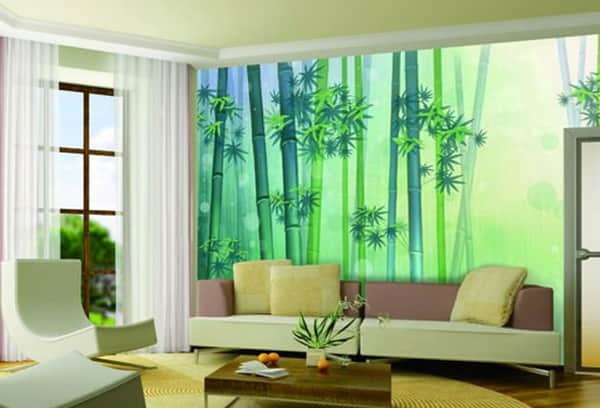 Such wallpapers allow you to immerse your living space in the harmony of nature and fill it with freshness and vivid colors. 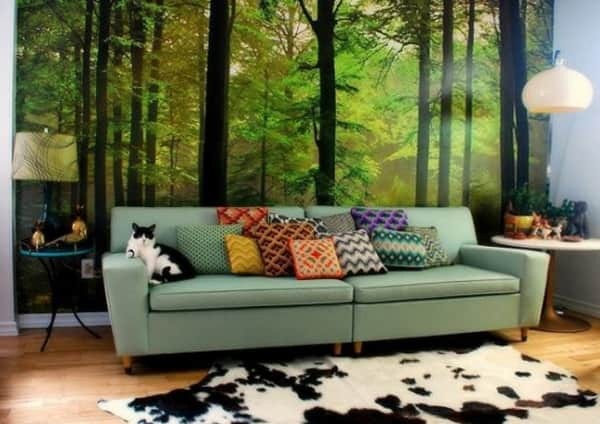 Thanks to the wallpaper, anyone can bring nature into their home without having to make expensive or extreme renovations. Today, classic style wallpapers celebrate their return as a fashion trend. 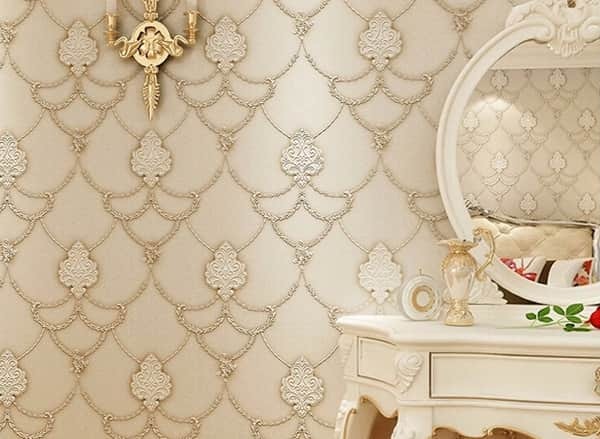 Classic style wallpapers decorate the room with classics, immersing it in an atmosphere of unsurpassed sophistication and recreating the elegance of the good old days. 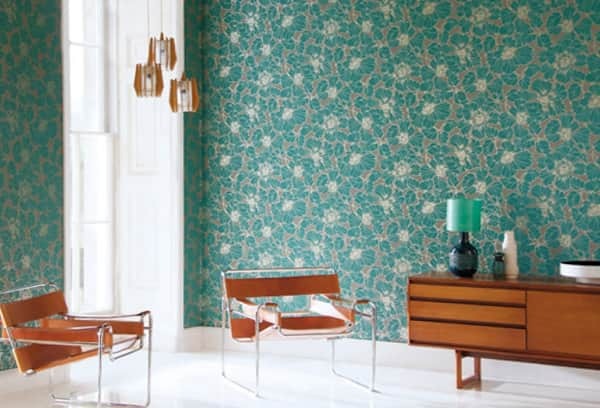 To put it simply, classic wallpapers turn the house into a temple of impeccable taste. 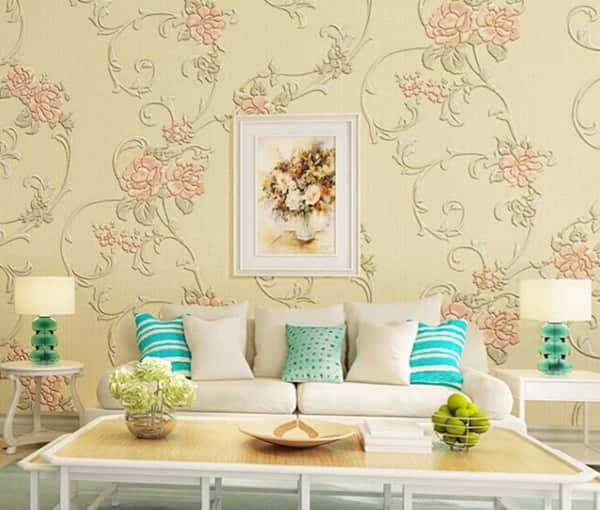 Wallpapers with light pastel shades with floral motifs or palmate motif. 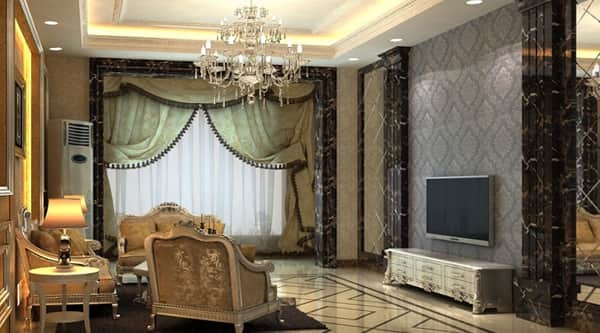 Wallpaper, as well as curtains for the hall, might just be the elements needed to change the atmosphere of your interior. Wallpapers and curtains emphasize the beauty of spacious halls with solemn décor and play a key role in creating a special microclimate. 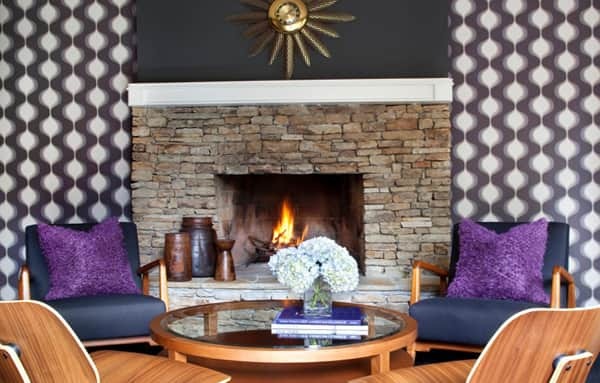 For many years, designers have been revamping old styles to fit modern spaces. Famous designers whose works is recognized as reformist, often just adapted old styles and made changes. Even William Morris, who is called the inventor of wallpaper, found motifs for his elegant decorative designs in medieval manuscripts and in Renaissance textiles. 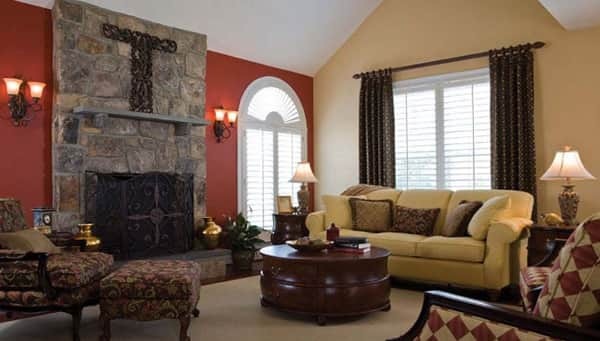 Many would like to live in old-fashioned homes or homes that have been modeled after classic styles. 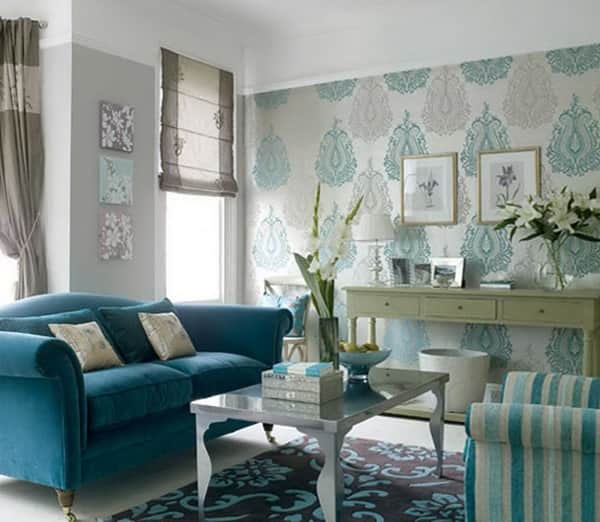 Therefore, the classic design of wallpaper, textiles and furniture is constantly winning over more loyal fans. Figures and motifs: Undulating lines that often take the form of flower stalks and buds, roots, wings of insects, grape mustaches and pods. Paradise birds: Peacocks, parrots (artists and designers are always in search of exotic and colorful creatures of nature). Insects: Grasshoppers, butterflies, dragonflies, fireflies. The whip’s impact is a symbol of movement in the Art Nouveau style, a “pouring” line created by the German sculptor Herman Obrist. It is one of the most iconic decorative motifs of Art Nouveau. Art Deco, which came after Art Nouveau, was a leading style between the two World wars, until the end of 1945. The design is characterized by rich colors, bold geometric shapes and rich ornaments. Until today, it retains its real influence, especially after the release of the movie “The Great Gatsby,” which can be called the Art Deco encyclopedia. 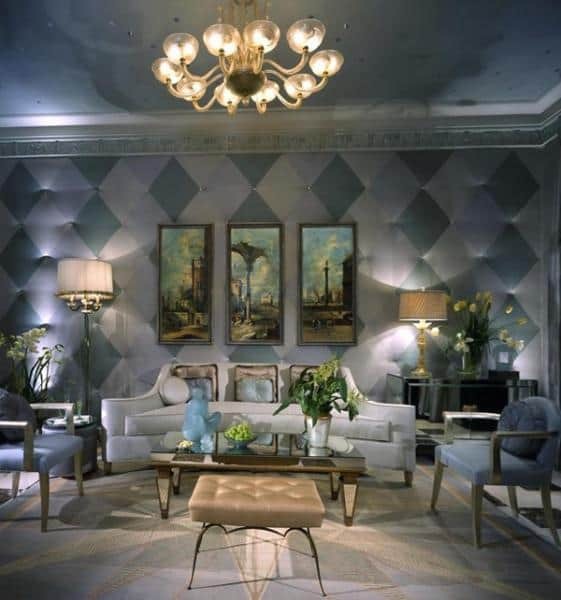 It is noteworthy to note that the talented production designer Catherine Martin, who received an Oscar for her work in The Great Gatsby, released her own wallpaper and clothing line called Metropolis, which includes Art Deco motifs (metallized wallpaper and velvet with geometric ornaments). Bright colors (emerald green, canary, amethyst, blue peacock, shiny red). 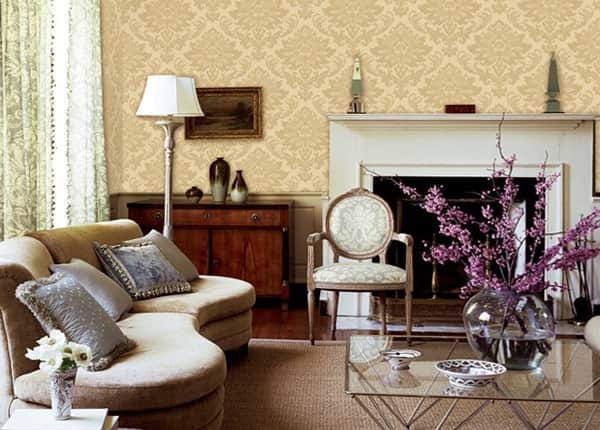 Thanks to the “French” wallpaper, you can infuse a romantic vibe into the atmosphere of your home. 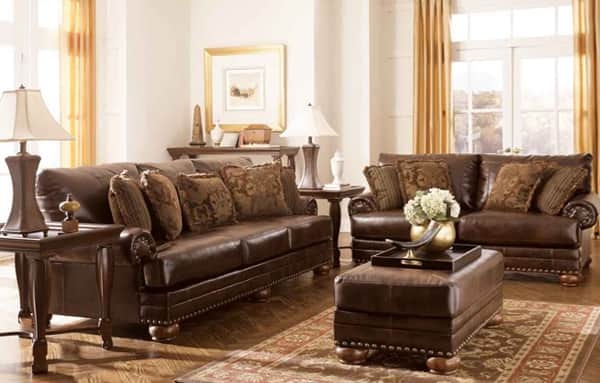 You can achieve this by using décor which speaks of tender and affectionate vibes, inspired by rustic or country motives. The simplicity and authenticity of wallpaper in the French design style is reminiscent of the lavender and sunflower fields of Provence , offering gentle lilies of the valley to decorate the room with grace and femininity. 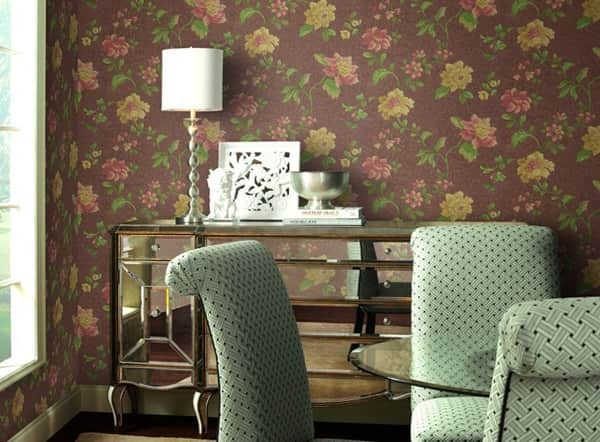 Elegance and luxury characterize other “French” wallpapers that are inspired by the refined art of Versailles. 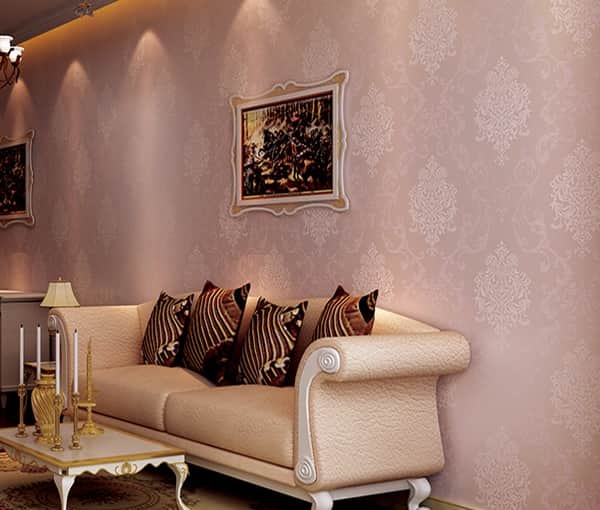 Wallpapers with designs of bouquets appear more refined when covered in gold, turning the room into a special space. 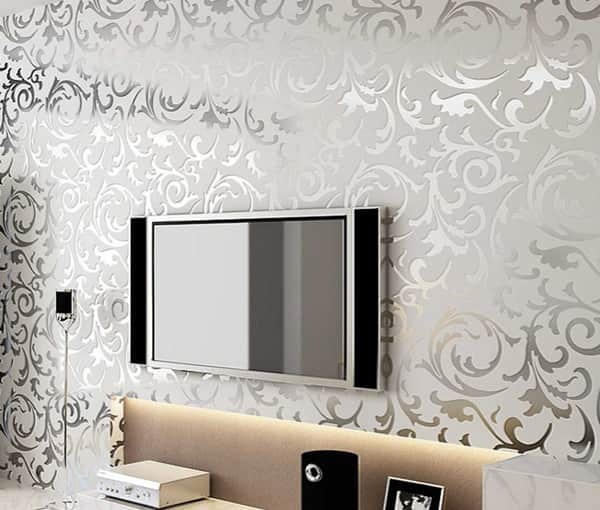 These wallpapers are most ideal for the living room and bedroom. However, these wallpapers should be used sparingly to avoid a visually heavy effect. The recommended use is on just one or two walls. Exclusive “loft” wallpaper, in which materials such as wood, iron and stone dictate the style, introducing rough and genuine beauty, can enhance the appearance of even the shabbiest studio or large spaces with industrial touches. 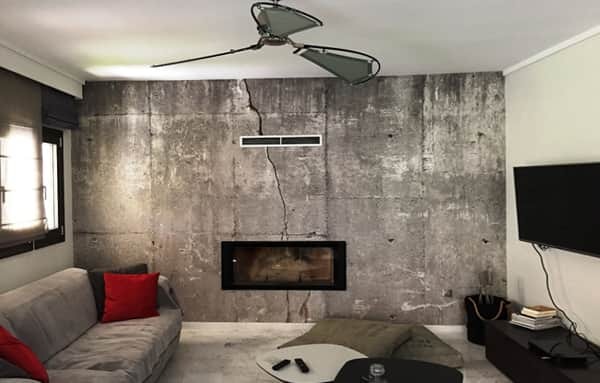 Thanks to the wallpaper with the effect of stone, you can recreate in the living room a style inspired by industrial objects of the 1980s. 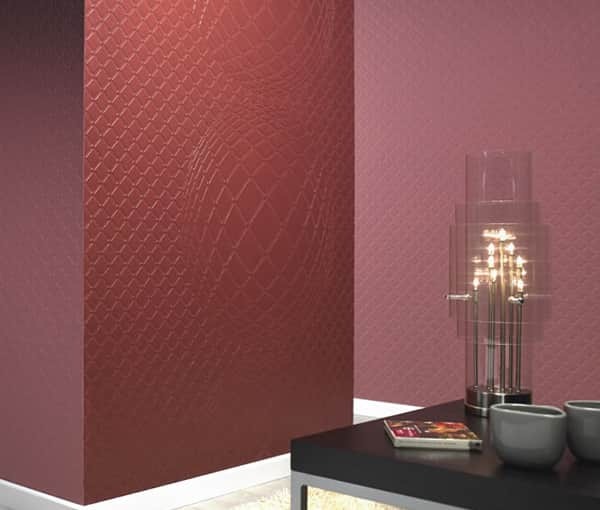 Choose wallpaper with gray stones or bricks of reddish shades. 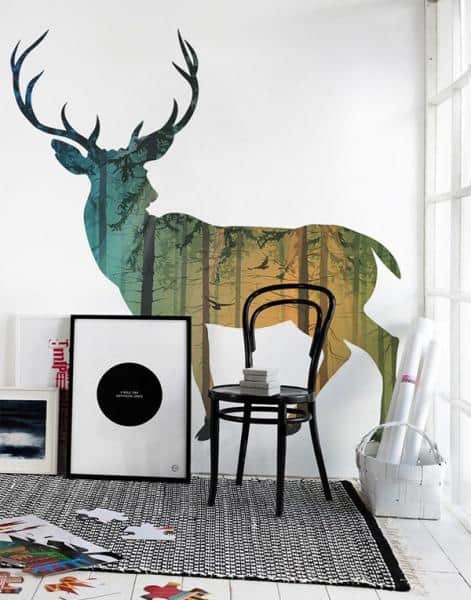 Do not forget about such strokes that complement the room’s beauty, such as a bicycle on the wall. 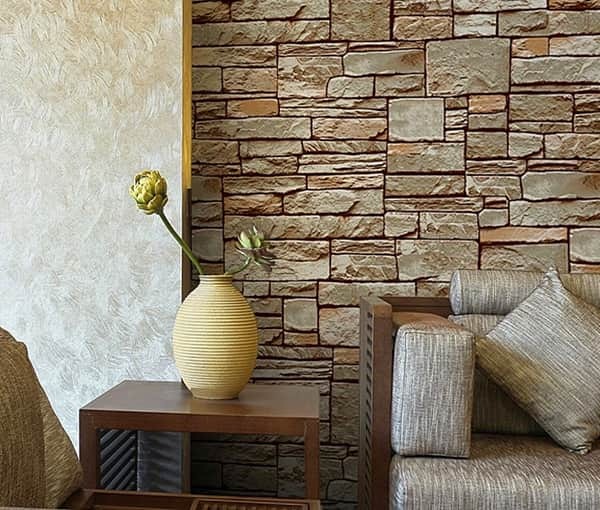 Wallpaper with the effect of a stone wall is not just the prerogative of living rooms only. 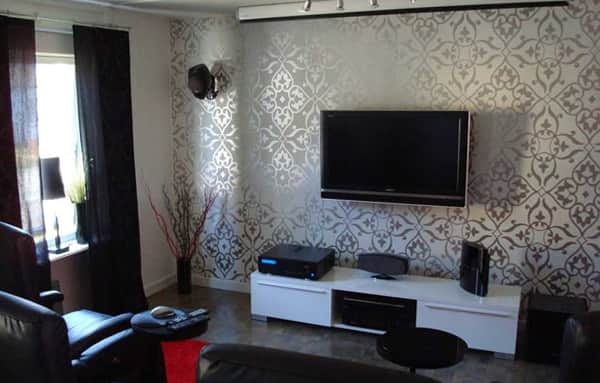 These wallpapers look great in the bedroom as well. 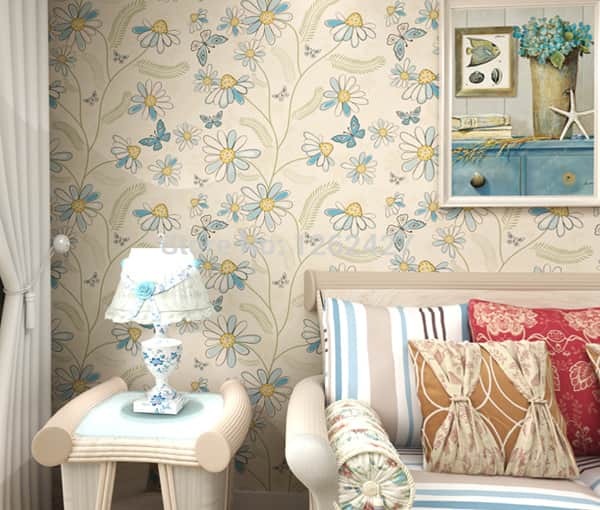 In case you opt for a patterned wallpaper, it is better to choose a pattern in light colors, that will fit well with birch furniture and a bed set of soft colors (antique white, ecru, gray-blue). 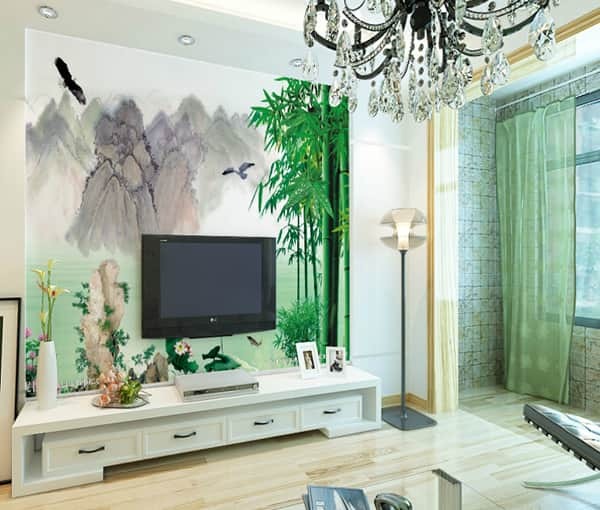 In complete harmony with furniture, fabrics and decor items, oriental style wallpaper will tell interesting stories and evoke emotions of distant lands. 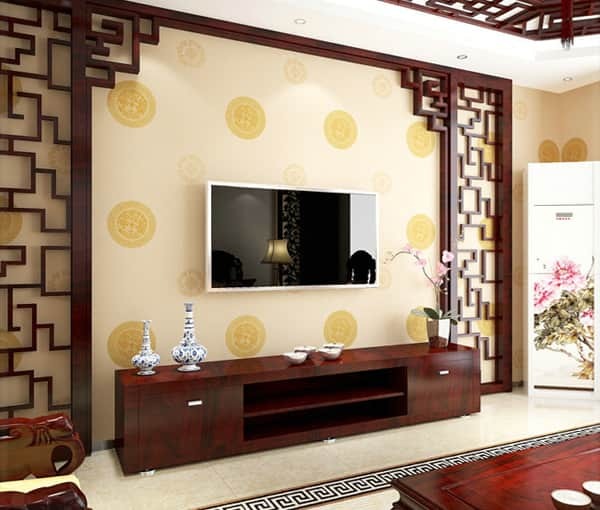 Oriental style wallpapers perfectly convey a sense of warmth and spiritual intimacy. The exciting and multifaceted beauty of oriental aesthetics, exquisite and eclectic, is felt in the space of the home, impregnated with charm. You only need to carefully pick up all the details for decorating the interior. 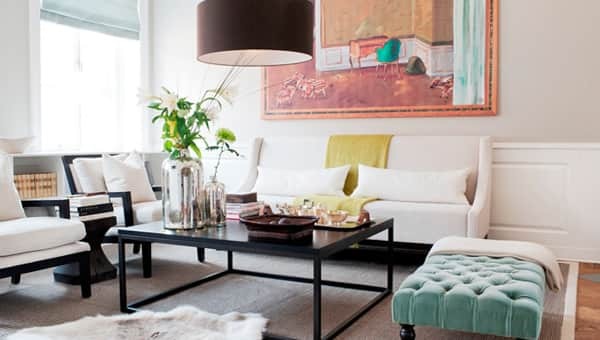 Wooden furniture, ottomans, pouffes and bright ethnic paintings are valuable allies in the décor of the oriental style. However, the main outstanding feature in the room should be the wallpaper. Damascus wallpapers, inspired by traditional design and original fabric patterns (twill or satin type) are perfect for the oriental style. 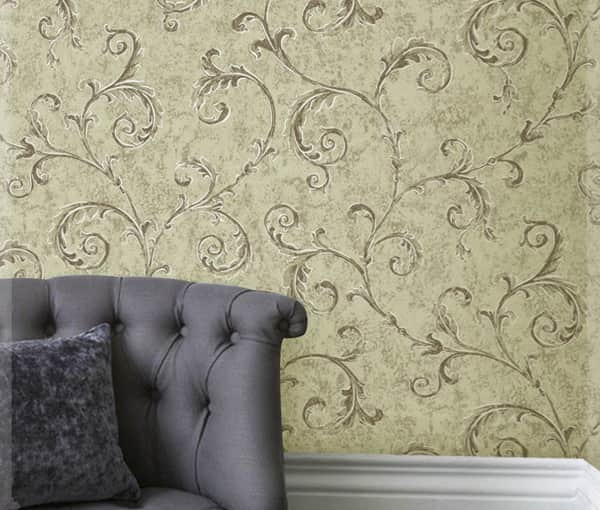 Damascus wallpapers are in particular, an exceptional choice for the hall. 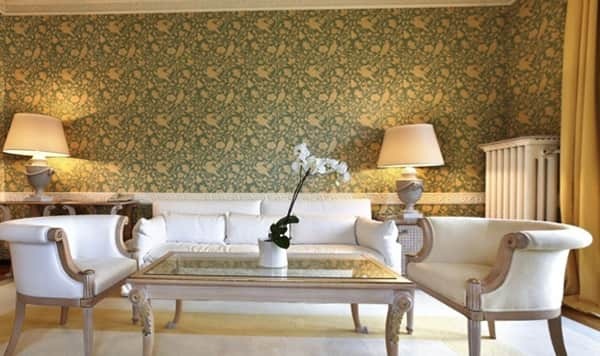 Motifs borrowed from historical fabrics are applied to the wallpaper, offering a classic and elegant decoration. Black and white is considered one of the most popular color combinations. 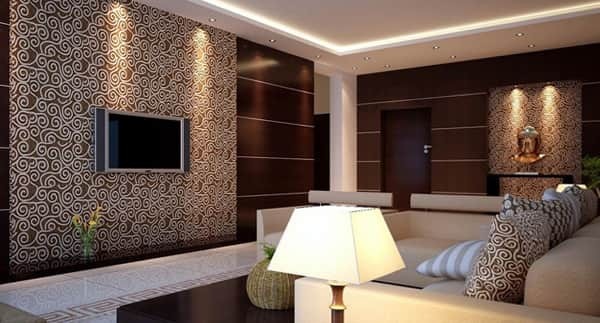 However, in recent years, attention is slowly shifting towards the beautiful “damask” wallpaper in purple, lavender, light yellow and even brown tones. 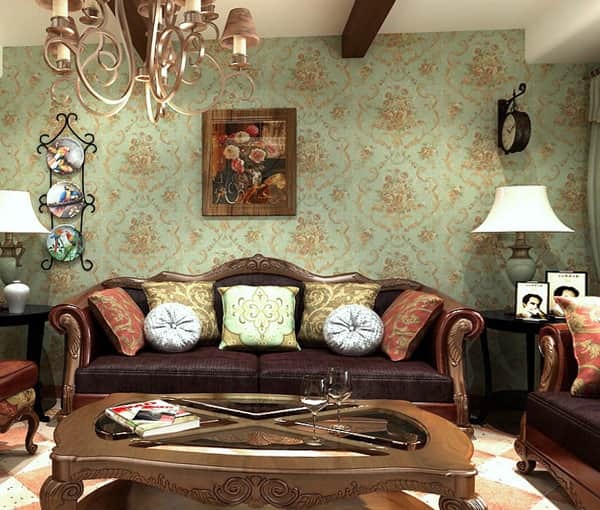 Damascus wallpaper is great for interiors in the ethnic and Tuscan styles. 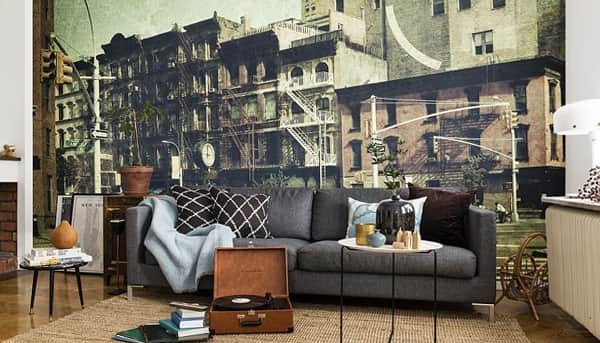 Still, these wallpapers are universal and fit in in a range of styles, from a home in the country, to a penthouse in the city, and in an apartment somewhere in the suburbs. 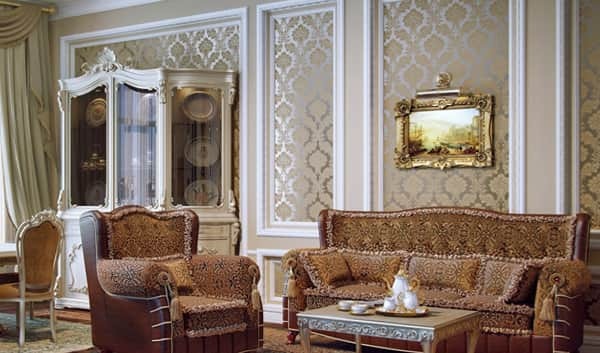 Damascus wallpaper works best when combined with wooden furniture, antique or modern furniture and furniture made from Plexiglas, plastic and steel. 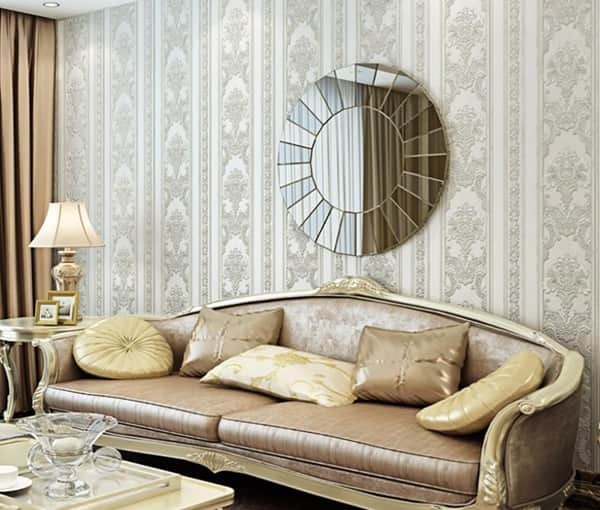 Due to their specificity, these wallpapers can additionally be used in any space of the house (living room, bedroom, and bathroom). The Moroccan style is colorful and earthy. 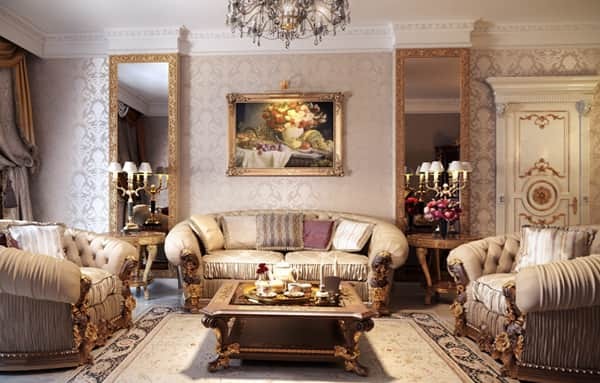 It is possible to create this style in the interior of the hall, with the inclusion of just a few key elements namely; Mirrors with intricate patterns, ceramic vases, mosaic countertops with extravagant patterns of bright colors, ethnic (Moroccan) lamps, sconces, shining gold chandeliers and patterned rugs. The main motifs for wallpaper in the Moroccan style are geometric ornaments (circles, rhombuses, triangles, arches, symmetrical lattices). 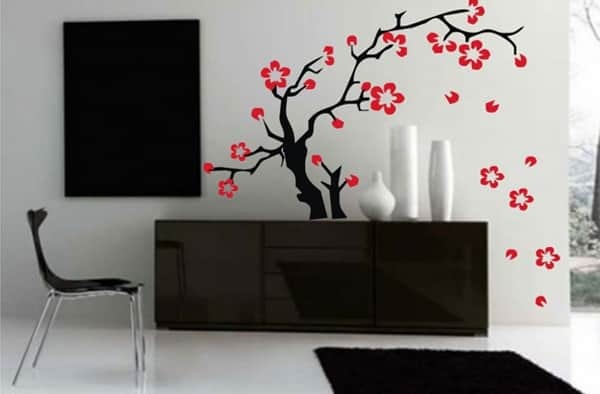 Japanese style wallpapers feature well-known cultural symbols of the country: cherry blossom, Mount Fuji, which is a symbol of the rising sun, koi carpets and umbrellas. What color are the walls of your room? If the question seems irrelevant, take a look at these pictures and you will be amazed. 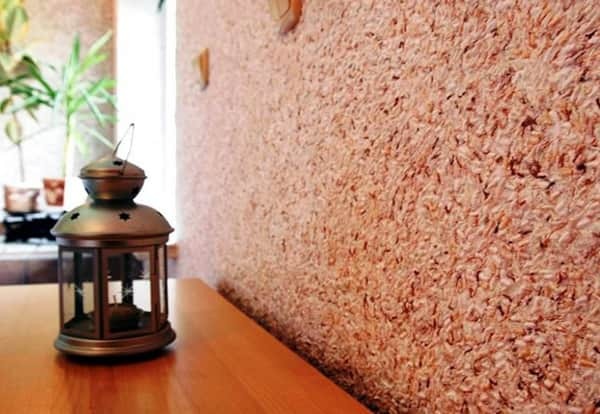 The color of the walls is not just a decorative detail, it affects the general atmosphere of the surrounding space, sometimes very unexpectedly. 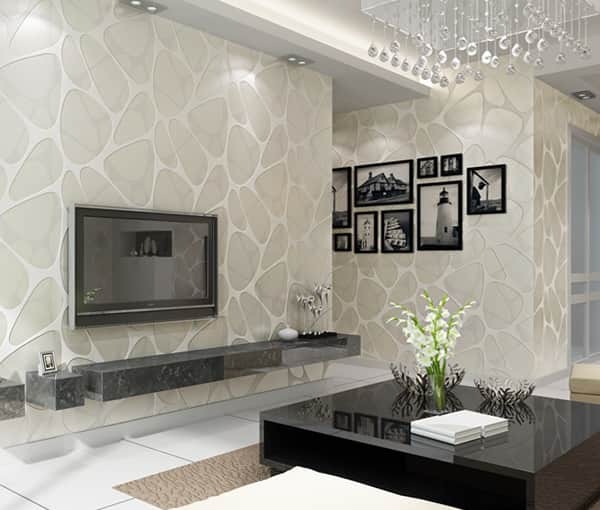 The tone of the walls leaves a deep impression on the appearance of the whole interior. The tone can help you achieve contrast or a sense of community. 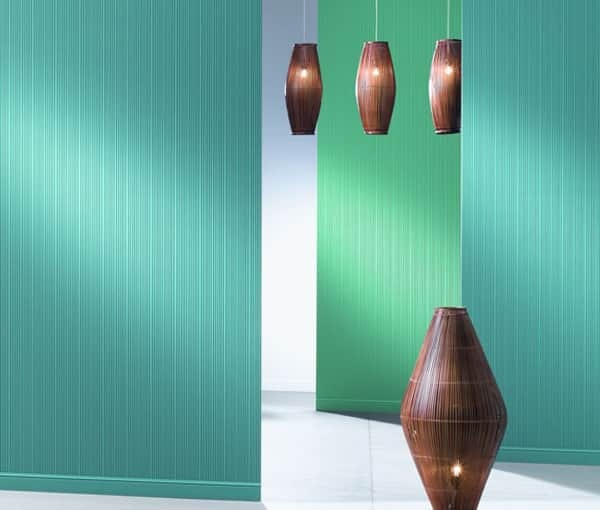 The choice of color in the hall is crucial for the effect that furniture should produce, enhancing its aesthetic capabilities and portraying the home in a new light. 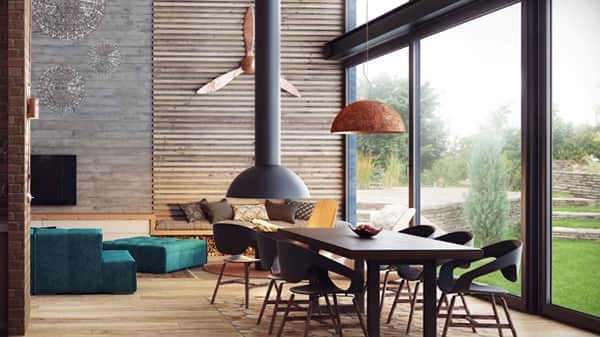 It is scientifically proven that the color of the walls illustrates the general mood of the home and has a significant impact on the household. For this reason, the color preferences for the bedroom are soft relaxing colors, whereas office desks go better with colors that concentrate attention. The hall is a room in which the family spends happy hours of leisure, receiving guests and meeting with friends. All pleasant emotions should be maximally displayed. For those who like surprises and are not afraid to be defiant, you can go with pink walls, which are unconventional yet glamorous and attractive. 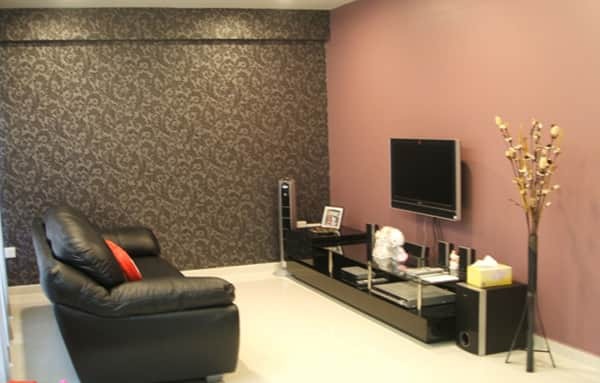 Pink walls are especially if complemented with magenta chairs and for optimal contrast, with a black sofa. To illuminate this fantasy, add a magnificent white carpet. An exciting effect is guaranteed. If pink is not your color, then choose the flawless modern elegance in black and white. 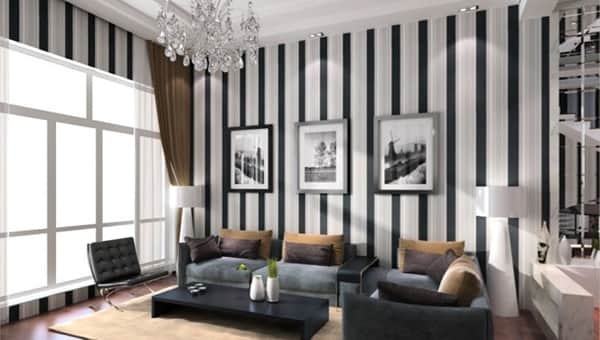 Wallpaper in black and white vertical stripes is a combination that you can count on for any interior. It always looks fresh and modern, and it is perfectly accentuated with the influence of other bright tones such as red, bright pink or turquoise. Give an outlet to creativity. 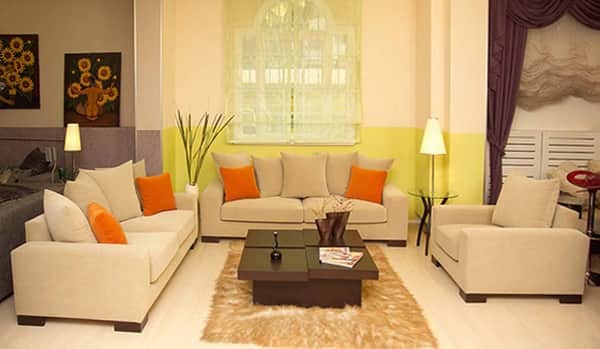 Choose juicy colors, like purple or fuchsia in contrast to pink-beige, so as not to “darken” the room. The result will be complex, but harmonious. For fans of the classical style, a good solution will be neutral colors like beige combined with cinnamon-colored wooden furniture. The result is stunning – the warmth of the golden autumn and the atmosphere of the old spirit. 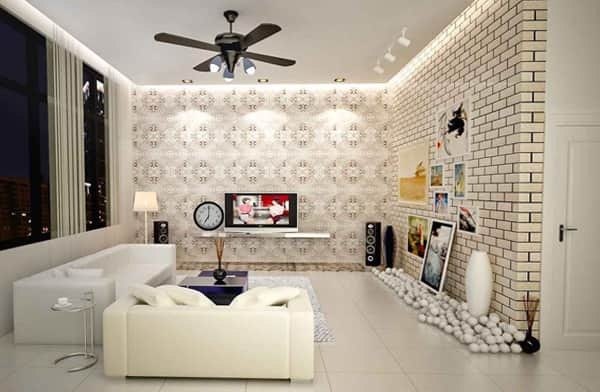 A modern hall looks best with walls in white, decorated with green motifs. If you prefer twilight, love secrets, “dress” the walls in navy blue, almost black wallpaper. Still, you should be careful not to create a funeral effect. Dilute the mystical gamut with decorative accessories in white, and even a little bit of kitsch will not be a hindrance. You cannot ignore the king of bold colors-red! Walls in red are a choice for the brave. The red color is passionate in itself, so you need to act cautiously when using it. 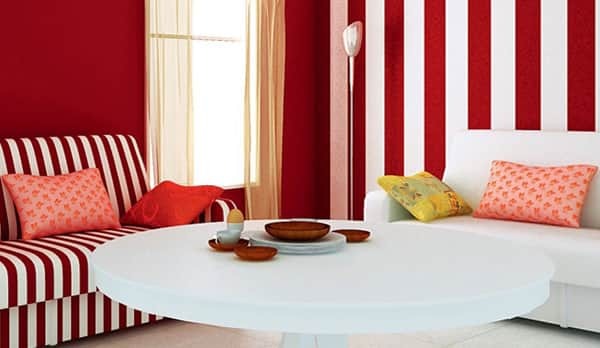 Avoid fancy furniture and choose lively shades (like the color of tomatoes) when using red wallpaper. Such a background is perfectly matched with soft 60s-style furniture, together with white upholstery with geometric ornamentation. 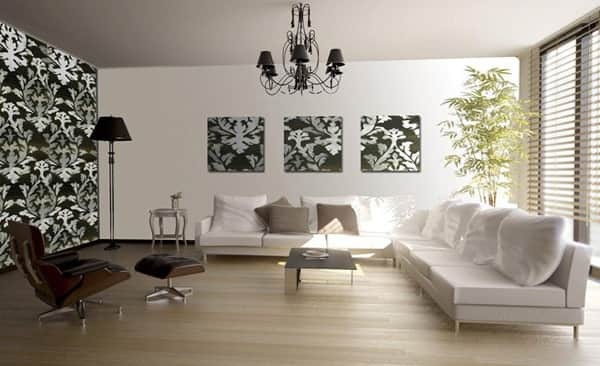 White walls make the room appear lighter and more spacious, but only on condition that appropriate furniture is used. 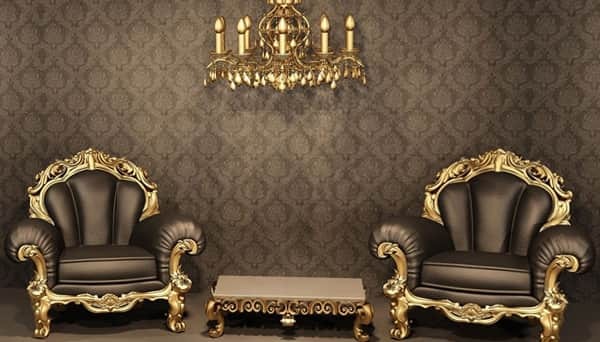 If you decorate the house with luxurious accessories, spread out cushions with gold trim on the couch. Most people know that one of the easiest ways to create an airy space is by the use of light colored objects to decorate walls, ceilings and even the floor. Mostly, white or pastel tones work best. 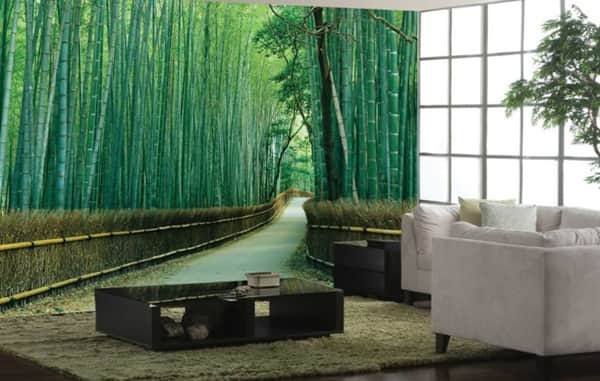 Today, wallpaper catalogs display eco-conscious tendencies. Light furniture in organic colors, caramel and honey tones is becoming more popular as a concept of interior design, giving the room a natural look and decorating it with a spring mood. 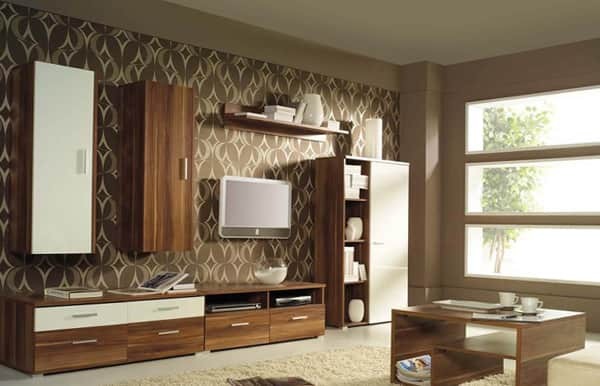 In the interior of small rooms, the ideal choice is furniture made of pine, chestnut, oak or cherry. These types of wood help create a sense of openness and spaciousness. 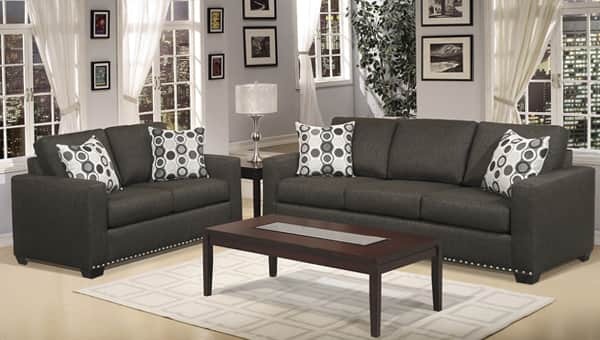 Such furniture relieves the space of feelings of heaviness and fussiness. 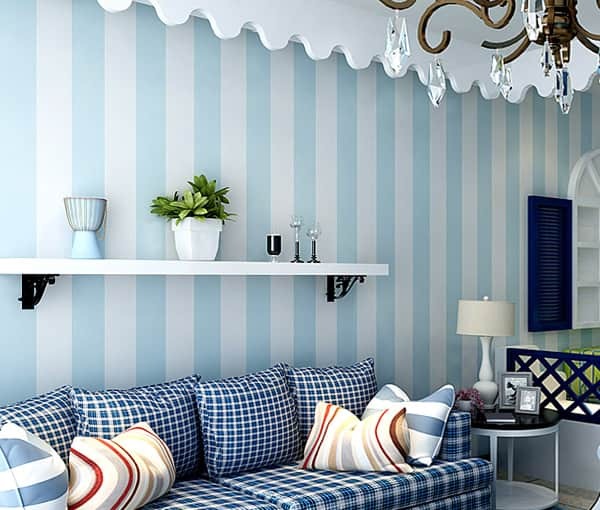 When choosing the color scheme of the wallpaper, which will serve as a background for light furniture, try clear white or pastel shades (light pink, vanilla, lilac, greenish-blue, light gray). 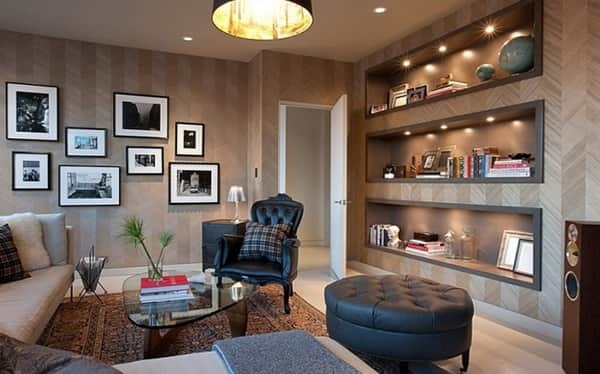 Designers propose use of some tricks to create a sense of depth in a small room. 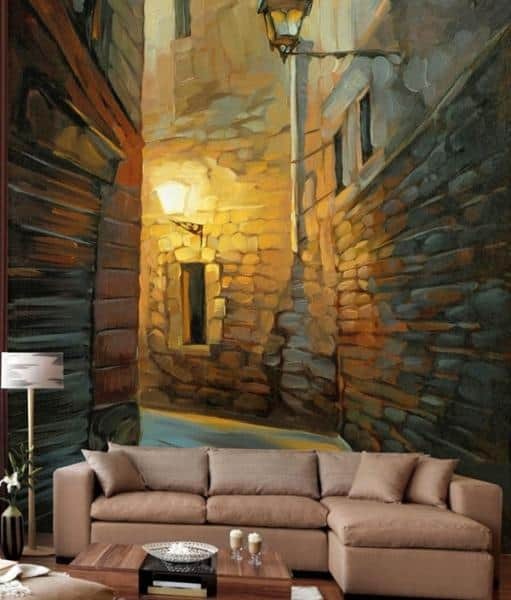 One of these tricks is the use of a little dark color on the walls, such as on the frames for photographs or paintings. If your preferences lie in favor of dark shades, then wallpaper in dark brown or dark blue shades can create the illusion of “infinity” of space. Try to balance all the details of the interior, including mirrors, tables, floor lamps and stretch ceilings so as to create a warm glow. If your choice of furniture falls on dark colors like brown or gray, make the environment lighter by selecting wallpaper in white tones. 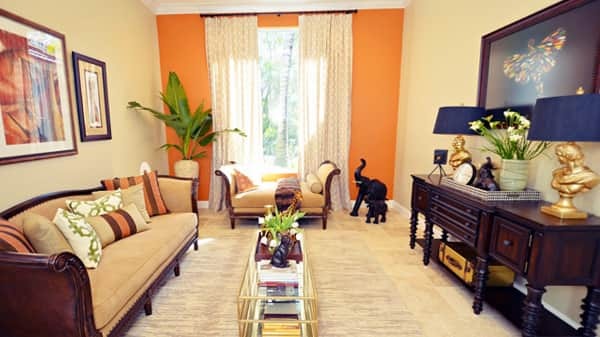 For secondary elements like textiles and curtains, beige, cream, ocher and sand do the magic. Add contrast in small portions of yellow, red or orange-colored accessories. In most cases, the choice is tied to subjective preferences and alternatively it can be lilac, fuchsia, eggplant color or pink. 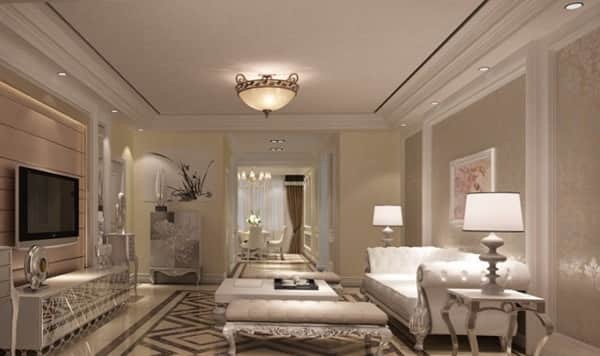 White colors are suitable for a carefree, young and modern environment, while neutral colors are ideal for classical styles, including neoclassicism and neo baroque. 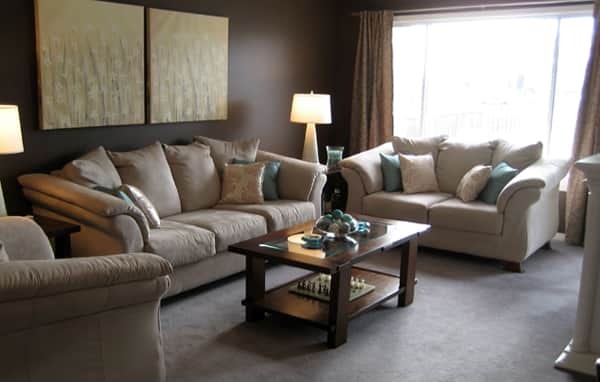 Under specific conditions, you can use furniture of any color. 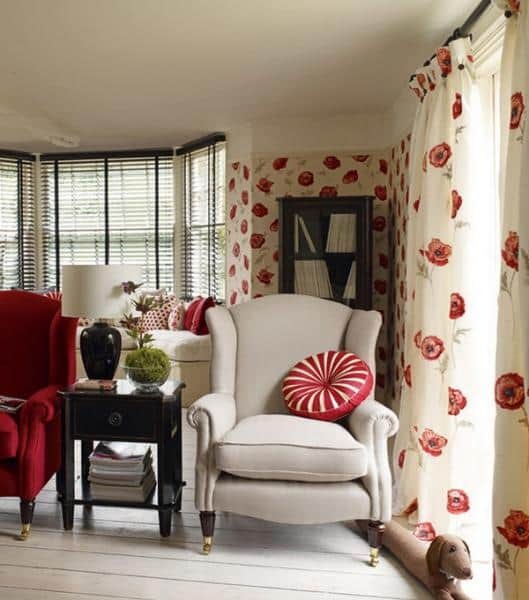 The easiest way to complete a set of furniture (sofa, armchairs) is to add red, turquoise and green to the white background. 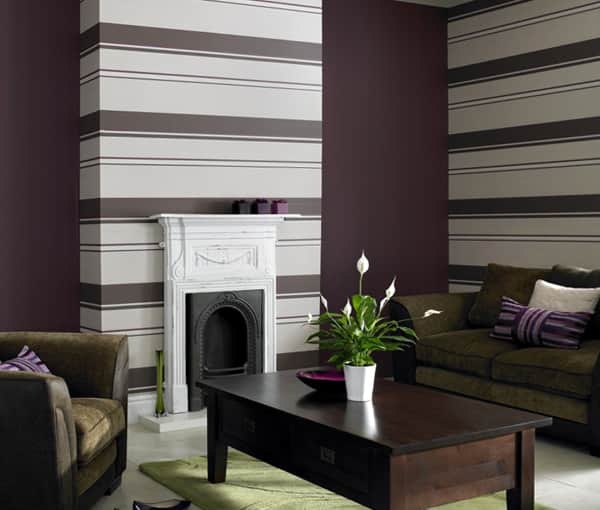 It is also a brilliant idea to add wallpapers with small color strips. 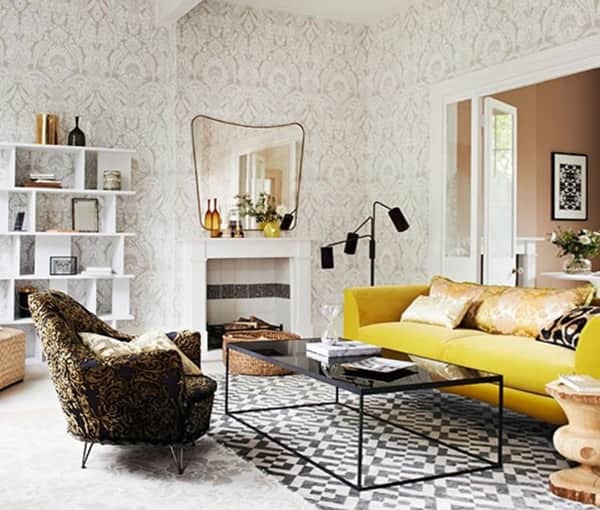 Interesting combinations of black and white wallpaper with furniture in red or yellow is amazing. Such a scheme creates a good contrast and is relatively easy to implement in practice. Black and white plus green or turquoise is also a successful combination – exotic, but very fresh. 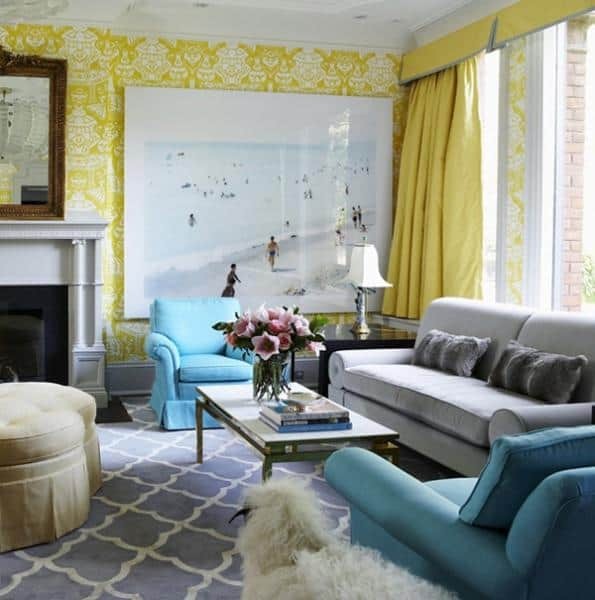 Decorating the walls with wallpaper of different shades of the same color in sequence. 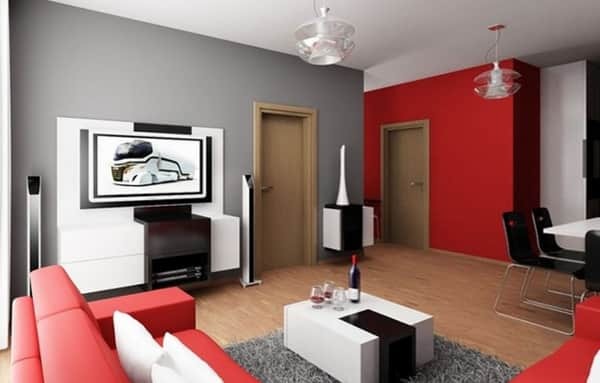 An interesting option is to combine contrasting colors (red in combination with white, blue with yellow). 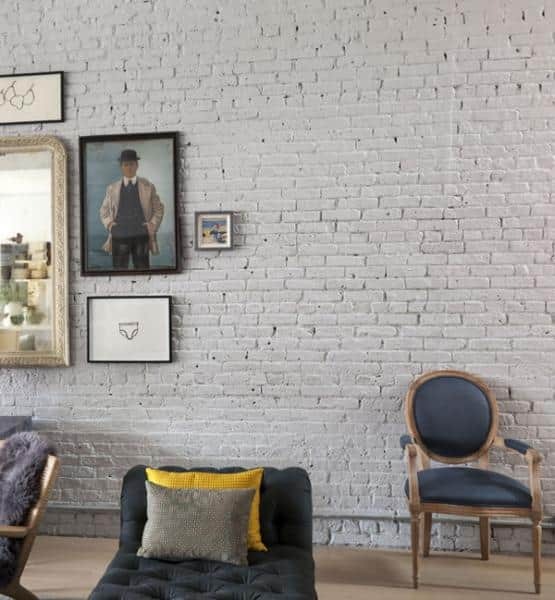 Go with an innovative method- decorating some areas of the wall with different colors.This results in an edgy modern look, but you need to be especially careful when choosing the colors to avoid unpleasant consequences from an aesthetic point of view. 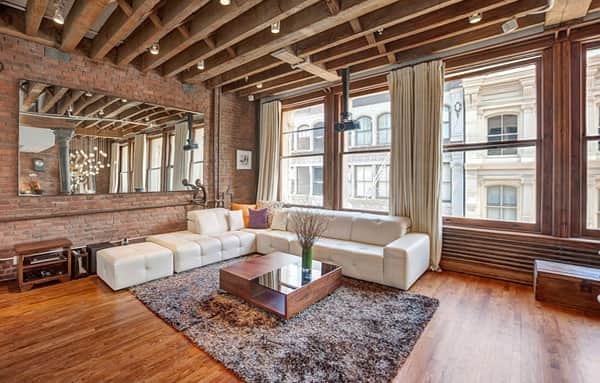 Décor for studio apartments requires a considerable amount of effort and a few innovative ideas. 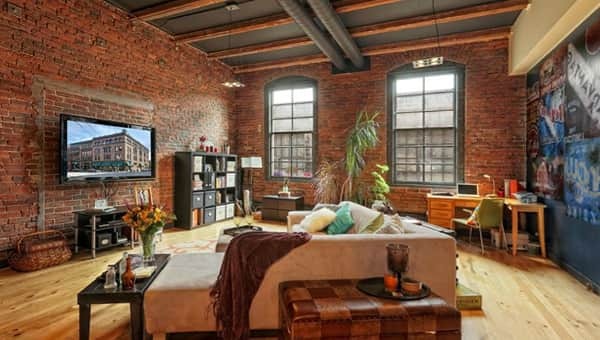 An apartment of this type has its advantages, but comes with one obvious drawback – a small size. Due to limited space, designing it is often a difficult task because it combines different conditions of life: cooking, watching TV, receiving guests and so on. 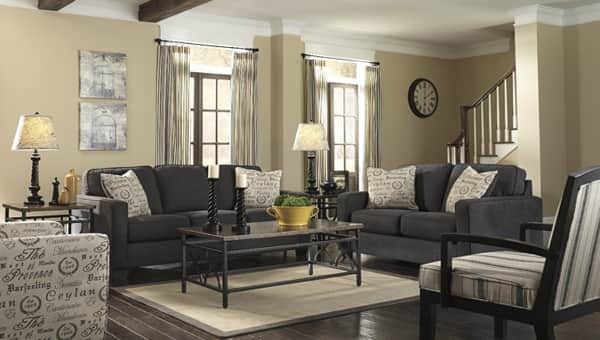 It is better to go with a neutral urban style to make up for the lack of size. How to choose a wallpaper? Novelties with silver and black accents help to make the interior visually larger, at the same time adding a unique touch. 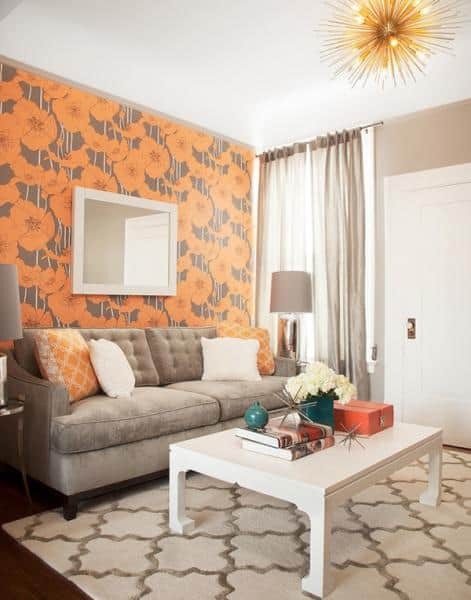 Just turn the narrow room into a living, color-filled space with black-and-orange wallpaper with a three-dimensional effect. 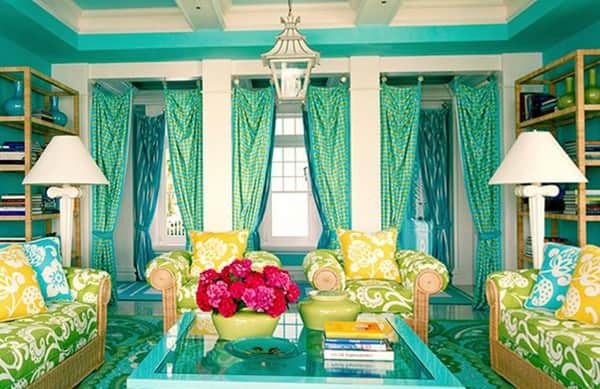 Green transparent curtains, dividing the room into two parts, add a picturesque effect.